the father of the Palestinians at that time, with no [Jewish] state and no so-called “occupation,” no territories and no settlements, already sought, through systematic incitement, to annihilate the Jews. Regrettably, Hajj Amin el-Husseini is still a venerated figure in Palestinian society, he appears in study books and is exalted as the father of the nation, and this incitement that began then, incitement to kill Jews, continues. Despite his role in fomenting the1920 pogroms against Palestinian Jews, el-Husseini was pardoned and subsequently appointed mufti of Jerusalem by the British high commissioner, in May 1921, a title he retained, following the Ottoman practice, for the remainder of his life. Throughout his public career, the mufti relied upon traditional Koranic anti-Jewish motifs to arouse the Arab street. For example, during the incitement which led to the 1929 Arab revolt in Palestine, he called for combating and slaughtering “the Jews.” not merely Zionists. In fact, most of the Jewish victims of the 1929 Arab revolt were Jews from the centuries-old dhimmi communities (for example, in Hebron), as opposed to recent settlers identified with the Zionist movement. The mufti remained unrelenting in his espousal of a virulent, canonical Islamic Jew-hatred as the focal tenet of his ideology, before, during, and in the aftermath of World War II, and the creation of the State of Israel. He was also a committed supporter of global jihad movements, urging a “full struggle” against the Hindus of India (as well as the Jews of Israel) before delegates at the February 1951 World Muslim Congress: “We shall meet next with sword in hand on the soil of either Kashmir or Palestine.” Declassified intelligence documents from 1942, 1947, 1952, and 1954 confirm the mufti’s own Caliphate desires in repeated references from con­texts as diverse as Turkey, Egypt, Jerusalem, and Pakistan, and also include discus­sions of major Islamic conferences dominated by the mufti, which were attended by a broad spectrum of Muslim leaders literally representing the entire Islamic world (including Shia leaders from Iran), that is, in Karachi from February 16–19, 1952, and Jordanian-occupied Jerusalem, December 3–9, 1953. 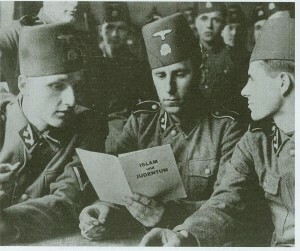 During 1938, a booklet Muhammad Sabri edited, Islam, Judentum, Bolschewismus (Islam, Jewry, Bolshevism), was published in Berlin by Junker-Duennhaupt [Dünnhaupt]. Sabri’s booklet included Hajj Amin el-Husseini’s 1937 declaration—also deemed by some as a “fatwa” (an Islamic religious ruling)—appealing to the worldwide Muslim umma. El-Husseini’s declaration was extracted and reprinted, separately, by the Nazi regime as Islam und Judentum (Islam and Jewry), and distributed to Muslim SS units in Bosnia, Croatia, and the Soviet Union. As I detailed in a 2103 monograph, which provided, and riveted upon, the first full English translation of el-Husseini’s 1937 “religious edict” (“fatwa’) about the Jews (available here; and as a free pdf here), the former Mufti of Jerusalem exclusively invoked traditionalist Islamic themes, familiar to the Muslim masses, to incite their annihilationist Islamic Jew-hatred. Reiterating foundational Jew-hating motifs from the Koran itself, and embodied by the inflammatory words and murderous actions of Islam’s prophet Muhammad (in the “hadith” or traditions, and earliest pious Muslim biographies of Muhammad), el-Husseini’s traditional Islamic Jew-hatred has remained a staple of contemporary Palestinian Muslim religious discourse, through the present. Although a complete understanding of el-Husseini’s 1937 arguments requires a careful reading of all the evidence adduced in my original essay, below is the crux of the analysis. [T]he Arabs have learned best how they really are, that is, as they [the Jews] are described in the Koran and in the sacred scriptures… The verses from the Koran and hadith prove to you that the Jews have been the bitterest enemies of Islam and continue to try to destroy it. What can be readily gleaned from a careful, objective reading of el-Husseini’s proclamation was there were no concrete, substantive references to any non-Islamic sources of antisemitism. This absence of references contrasted starkly with the numerous and specific antisemitic motifs from Islam’s canonical texts—the Koran (consistent with its gloss in authoritative Koranic commentaries), hadith, and sira—which el-Husseini’s declaration invoked continuously, from opening to closing. A simple enumeration conveyed el-Husseini’s extensive use of references from Islam’s canonical texts: ten explicit references to Koranic motifs (including eleven separate verses quoted directly in the proclamation), with an additional six implicit references; two explicit citations of the sira, and five implicit references; and two major, explicit citations (with quotation) of hadith, accompanied by three additional implicit references to the hadith literature. These citations are complemented by an explicit reference to the great early Muslim scholar al-Tabari (d. 923), and his monumental History. El-Husseini’s interpretation of the eleven Koranic verses he quotes, directly, comports with their authoritative exegeses, classical, and modern. For example, concluding his litany of Koranic quotations (i.e., 2:109, 59:2, 3:99-102, 5:49, 2:143, 2:144, 4:51, 4:52, & 5:82) appropriately, with Koran 5:82, el-Husseini insists this verse “quite unmistakably characterizes the position of Islam and Judaism.” His assessment is upheld by a continuum of authoritative Koranic exegeses that span over a thousand years, till now. The classical Koranic commentaries on Koran 5:82 by Tabari, Zamakashari (d. 1143), Baydawi (d. 1316), and Ibn Kathir demonstrate a uniformity of opinion regarding the animus of the Jews toward the Muslims, which is repeatedly linked to the curse of Koran 2:61 (i.e., for killing prophets, and transgressing against the will of Allah, repeated at verses including 2:90-91, 3:112, 3:181, and 4:155). A verse in the Koran explains the Muslims’ relations with the Jews and the polytheists. The second part of the verse describes the Muslims’ relations with the Christians, and the third part of the verse explains why the Christians are the closest and most friendly to the Muslims. This is an historical perspective, which has not changed to this day. See how we suffer today from global Zionism and Judaism, whereas our peaceful coexistence with the Christians has withstood the test of history. Since the inception of Islam 1,400 years ago, we have been suffering from Jewish and Zionist interference in Muslim affairs. This is a cause of great distress for the Muslims. The Koran said it and history has proven it: “You shall find the strongest among men in enmity to the believers to be the Jews and the polytheists.” This is the first part. The second part is: “You shall find the closest in love to the believers to be those who say: ‘We are Christians’.” The third part explains why the Christians are “the closest in love to the believers,” while the Jews and the polytheists are the exact opposite. Despite its minor errors, or deviations, Hajj Amin el-Husseini’s 1937 proclamation demonstrated great fidelity to the canonical Islamic narrative regarding the Jews. Seminal Western academic studies of how the Jews are depicted in the sira, hadith, and Koran, independently validate el-Husseini’s assessment of these canonical Muslim sources. Moreover, these latter analyses have long been available to the academic community. Two prominent examples include Hartwig Hirschfeld’s detailed mid-1880s analysis of the sira accounts of Muhammad’s interactions with the Jews, and Georges Vajda’s 1937 essay “Juifs et Musulmans selon Le Hadit” (“Jews and Muslims according to the Hadith”)—a magisterial seventy-page analysis, replete with 202 accompanying notes—which remains the definitive study of Jews and their relations with Muhammad and the Muslims, as depicted in the hadith. The Koran, of course became a mine of anti-Jewish passages. The hadith did not lag behind. Popular preachers used and embellished such material. The numerous salient examples of Islam’s canonical Jew-hatred punctuating Hajj Amin el-Husseini’s 1937 declaration validated Perlmann’s concise overarching assessment of these foundational Islamic sources, and their tragic application across space and time, into the modern era. El-Husseini’s promulgation of jihad and canonical Islamic Jew-hatred in pursuit of the destruction of Palestinian Jewry, and later, the nascent Jewish State of Israel, has reverberated across the ensuing decades. Consider two complementary fatwas, one written January 5, 1956, by then grand mufti of Egypt, Sheikh Hasan Ma’moun, and another January 9, 1956, signed by the leading members of the Fatwa Committee of Al Azhar University—Sunni Islam’s Vatican—and the major representatives of all four Sunni Islamic schools of jurisprudence. These rulings elaborated the following key initial point: that all of historical Palestine—modern Jordan, Israel, and the disputed territories of Judea and Samaria, as well as Gaza—having been conquered by jihad, was a permanent possession of the global Muslim umma (community), “fay territory”—booty or spoils—to be governed eternally by Islamic law. Although free of eschatological references, the January 1956 Al Azhar fatwas’ language and arguments—pronounced from Sunni Islam’s most esteemed religious teaching institution—are otherwise indistinguishable from those employed just over three decades later by Hamas (in its 1988 covenant), revealing the same conjoined motiva­tions of jihad, and conspiratorial Islamic Jew-hatred. Recent polling data indicate that these traditionalist Islamic views—espoused across a continuum of 75 years by el-Husseini, Al Azhar University, and Hamas—resonate with the Palestinian Muslim population. American pollster Stanley Greenberg performed what was described as an “intensive, face-to-face survey in Arabic of 1,010 Palestinian adults in the West Bank and the Gaza Strip.” As reported in July, 2011 these data revealed that seventy-three percent of Palestinian Muslims agreed with the dictates of the apocalyptic hadith (Sahih Muslim, Book 41, Number 6985; included in both el-Husseini’s 1937 declaration, and the 1988 Hamas Covenant) calling for the annihilation of the Jews, to bring on the messianic age. Eighty percent supported the destruction of Israel by jihad, and the need to recruit the entire global Muslim community, or “umma” in this quintessential Islamic cause. Over four decades ago Bat Ye’or published a remarkably insightful analysis of contemporary Islamic Jew-hatred, in particular, its annihilationist predilection. She hypothesized that the rise of Jewish nationalism—Zionism—posed a predictable, if completely unacceptable challenge to the Islamic order—jihad-imposed chronic dhimmitude for Jews—of apocalyptic magnitude. The pejorative characteristics of Jews as they are described in Muslim religious texts are applied to modern Jews. Anti-Judaism and anti-Zionism are equivalent—due to the inferior status of Jews in Islam, and because divine will dooms Jews to wandering and misery, the Jewish state appears to Muslims as an unbearable affront and a sin against Allah. Therefore it must be destroyed by Jihad. Here the Pan-Arab and anti-Western theses that consider Israel as an advanced instrument of the West in the Islamic world, come to reinforce religious anti-Judaism. The objectionable and mendacious part of Netanyahu’s speech was when he suggested that it was al-Husseini who inspired Hitler to start the Holocaust. Dr. Bostom does not address this issue.